This Autumn - Winter season Van Cleef & Arpels invite you to join them on a Voyage of Discovery. Inspired by the novels of Jules Verne, Van Cleef & Arpels President Stanislas de Quercize and Creative Director Nicolas Bos kindly allowed some of us a sneak peak at the Haute Joaillerie collection that will be shown in full at the Paris Biennalle in September 2010. This is Couture Jewellery created using the adventure of travel as it's theme and I think that the beauty of the creations reflect the joy and richness of the memmories that we treasure from travel. It is made possible by The Young Talents and Mains d'Or. It is also important to note the deep romantic association that Van Cleef & Arpels have with Travel as the young Estelle Arpels and Alfred Van Cleef travelled the world in search of new experiences just as their clientele did. The boutique they founded oposite the Ritz in Paris also brought the world to them. These pieces are groupled around 4 novels, Five Weeks in a Balloon, Journey to The Centre of the Earth, From the Earth to The Moon and Twenty Thousand Leagues Under the Sea. Above is the Maximus Brooch and the White Nile Earrings inspired by the novel Five Weeks in a Balloon. 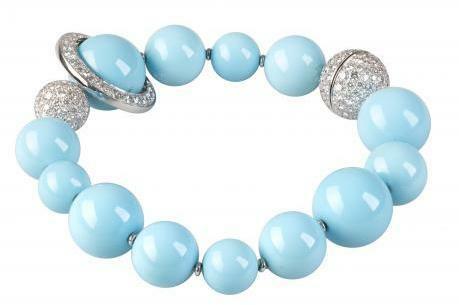 (C) Van Cleef & Arpels. I love Elephants and Maximus is a very unique Elephant. As with all the other pieces he is a one-off couture piece. create a bracelet, shown to the left. Below the bracelet is the Autour de la Lune clip. 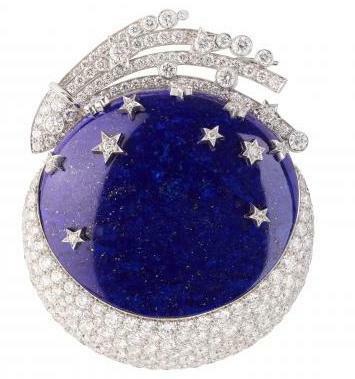 (C) Van Cleef & Arpels. shortend can be worn beautifully with the bracelet. Below, these 3 clips explore the maritime world and are among my favourites from the collection. 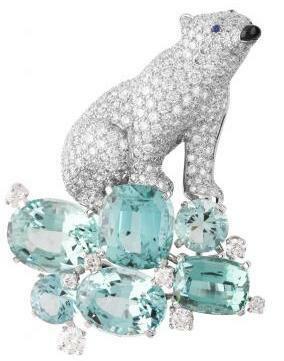 I love the way that the Maison has depicted animals in their couture creations. 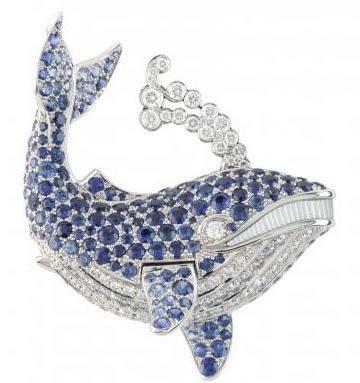 I love the Polaire clip, it's both opulent and very cute and he is accompanied by many sea creatures such as a little Whale that blows a water jet when the secret of the Jewel is activated. The Octopus of the Olindias clip below has a mysterious Medusa like quality according to Nicolas Bos and I think what is extraordinary is that the piece does caputure a real sence of movement. along the East African Shoreline. Balaine Bleue Clip. 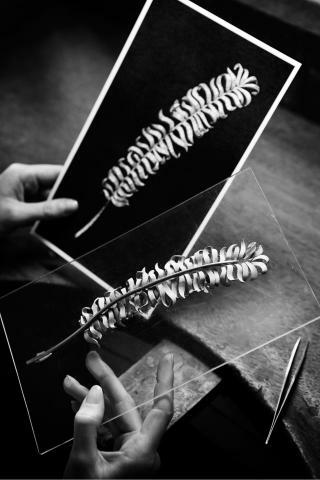 All above images (C) Van Cleef & Arpels. 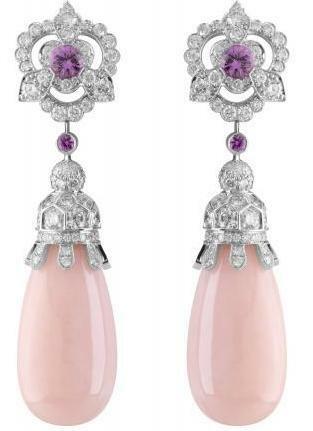 beauty of High Jewellery craftsmanship. Plancton Earrings. (C) Van Cleef & Arpels. At Boucheron across the Place Vendome I had the pleasure of speaking with the lovely Laura Schuetz who guided me through the Maison's Autumn - Winter 2010-2011 Haute Joaillerie collection. 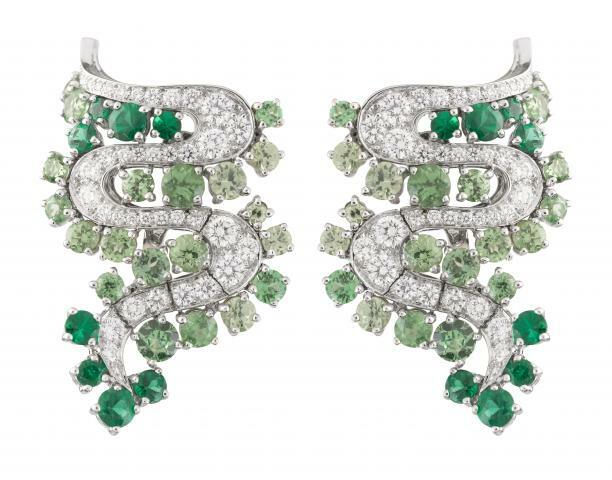 Love is in the air at Boucheron. The collection is based around several different themes of the game of seduction. So to get you in the mood for some romantic times with a special person this Autumn and Winter enjoy the collection below and please contact Boucheron if you would like to know more. silk ribbon laces that crisscross up the body. 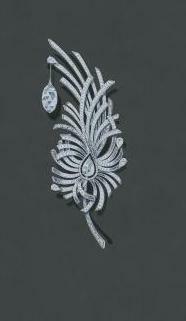 for several ladies to wear the pieces as a set ensemble (C) Boucheron. Hourglass Figure necklace. to wear the pendants individually for example. Below are two pieces from the Fatal Attraction theme. I love the marine blue, it's mesmerising like the sea around Greece and Italy also for me the shapes suggest marine life. I think it's beauty is very inviting. 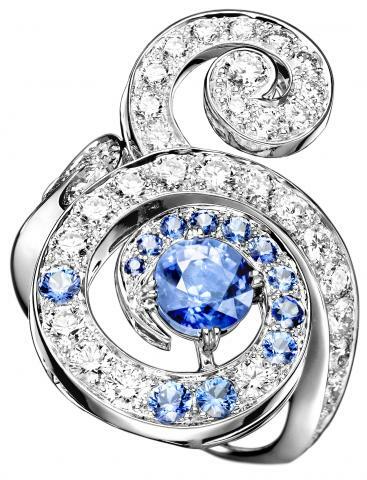 These pieces are created using saphires, diamonds and white gold. (C) Fatal Attraction Pendant earrings (L) & Fatal Attraction Ring (R). like the feelings of love that lead to attraction. worn about the waist or in the hair. (C) Boucheron. Fatal Attraction necklace. hand, ears or decollette you will have a memory of that special kiss forever. Using teardrop emeralds and a flower features of the 'Chic Lingerie' collection express the delicate feminity of those secrets that we keep closest to our chest. 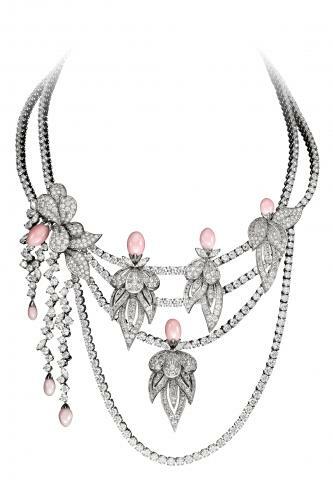 Boucheron sum it up very well "The diamond paved flower motif of the set evokes the idea of delicate lace lingerie. 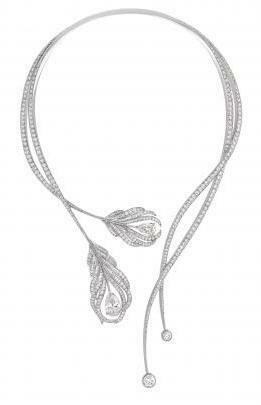 While a second double strand of diamonds on the necklace echoes the silk ribbon details often used on intimate apparel. A series of nine teardrop cut emeralds are a clever addition to the design and should resonate with any woman who is a connoisseur of fine lingerie." Further romantic guestures are made by the Pretty Puff piece that references the woman's time spent making up. Curlicue celebrates the crowning glory of women, our hair and Heavenly Aroma captures the mystique that women create from their perfume. I was given Boucheron's Fragrance Initial a few years ago and it's still one of my favourites. I said farewell to lovely Laura and her colleagues at Boucheron and left wondering what my favourite romantic moment would be surmised by this collection. I think it would be one of the pieces from the Stolen Kiss collection. Chaumet - Bijoux de Tete. The legendary Maison that brought the Tiara to the modern age opened it's doors for an amazing Catwalk show of Haute Joaillerie in the parfect setting. The Maison's own palatial home in Place Vendome. 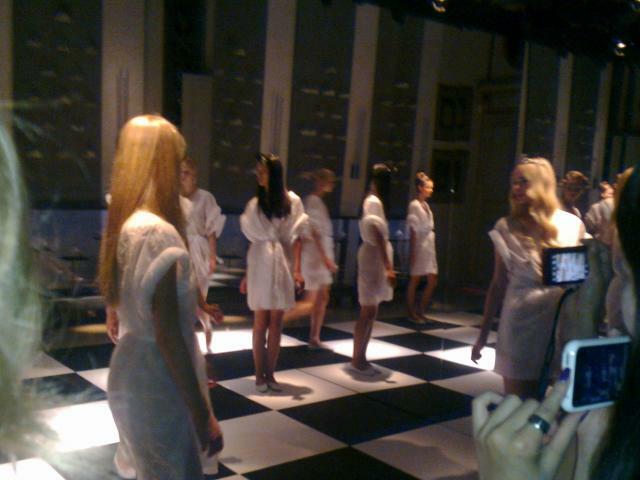 Chaumet had the opprtunity to show it's collection in it's traditional setting. before the show. (C) Angela Cliffe 2010 at Chaumet. I found it really wonderful to see the tiaras and 'Bijoux de Tete' shown in this way. of Chuamet and 'The memory of this great House'. Beatrice was kind enough to explain to me the significant role that Josephine Beauharnais played in building the renown of the House. The entrance to the salon was a beautifully decorated ante-room decorated with two large portraits of Josephine Beauharnais and Marie Lousie of Austria, respectivly the first and second wives of Emperor Napoleaon. 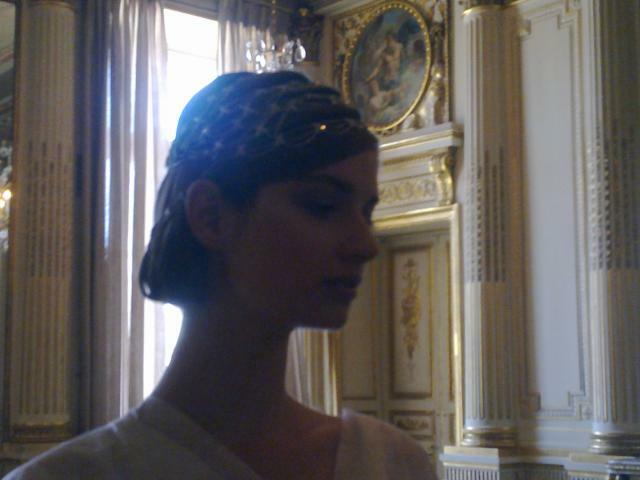 There, in the drawing room that could have been a room in Josephine's Palace, Beatrice explained to me the important role that Tiara's had in court ceremonial and also told me about Josephine and her role in European history. could not give him children. 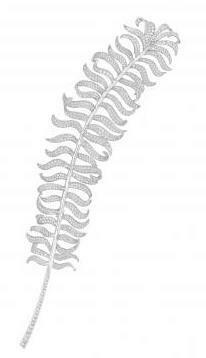 Bijoux de Tete, Ornaments of the Hair. Right. Josephine Beauharnais Empress of France. ancestry from the French gentry and Anglo-Irish plantation families. 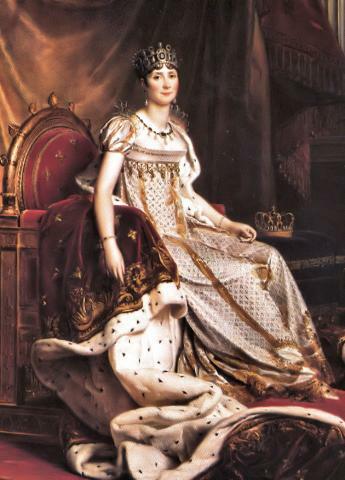 She was known as Rose until her marriage to Napoleon. Josephine's influence lives on in modern Royal Europe and beyond as women still wear tiara's at special events. Beatrice told me that they still create tiara's and tiara models each year for clients. As the models below show hair ornaments have never gone out of fashion. The last time that tiara's where seen on a large scale in the UK was at the coronation of Elizabeth II. This collection shows that hair ornaments of varying types from the tiara to the beautiful bijoux bumble bee (see below). At the Chanel Haute Couture show in July 2010 Daphne Guinness was noted for wearing diamonds in her hair. Hair ornaments will never go out of fashion and I think day to day it's a fun way to decorate your hair. When I'm reporting from Fashion Weeks I try to wear a Rose emblem in my hair. Here are two pieces from the Autumn - Winter 2010-2011 collection. 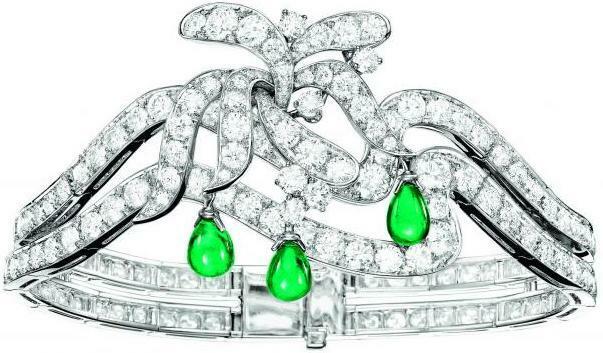 Chuamet's pieces are Haute in the truest sence as you cannot wear Haute Joaillerie any higher than on the head. 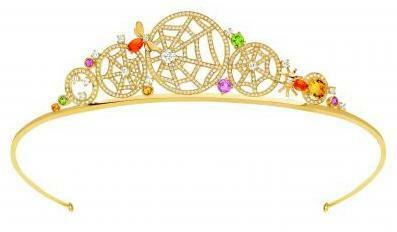 (C) Chaumet Attrape-Moi tiara. Bijou de Tete A-W 2010-11. 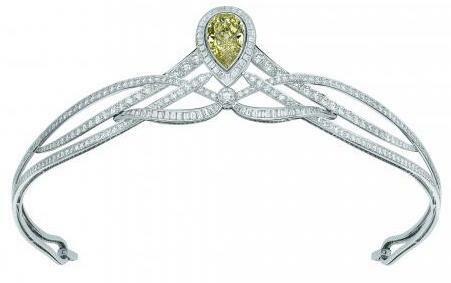 Left (C) Chaumet Josephine tiara 1. Bijoux de Tete A-W 2010-11. Center: Pear cut Yellow diamond. The Haute Couture Joaillerie show was held in a room with the most amazing display. The walls where lined with 'vitrines'. These cabinets displayed both tiara's and the equally beautiful models and casts that are made, to full scale before the finished tiara is produced. The defiles danced to a mixture of classical music exerpts interspersed with modern dance music. The music was synchonised to lights over them as they danced as chess pieces on their squares and one by one as the music changed and they had their cue to move from the light above. 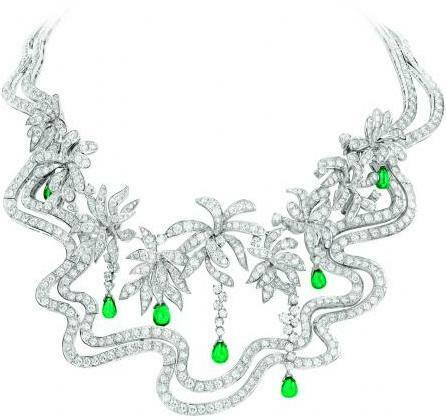 Image below from Haute Couture Joaillerie at Chaumet. Defile Bijoux de Tete (C) Angel Cliffe. (C) Chaumet. The Josephine collection tiara 2. 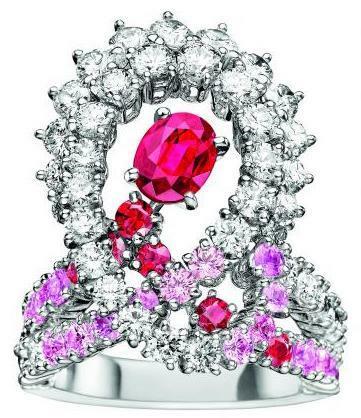 2 Periots, 2 Pink tourmalines, 1 Green Tourmaline and 101 brilliant-cut diamonds. I would urge as many people as possible to discover Chaumet and it's wonderful history. 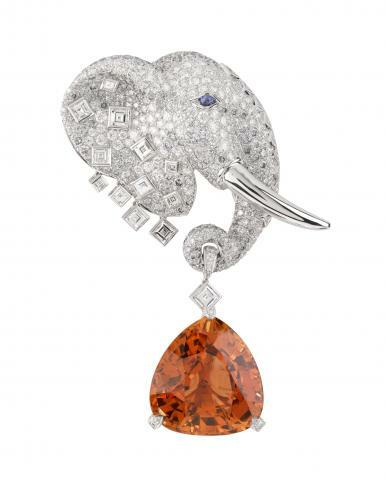 They have created a whole genre of Haute Joaillerie in the last 200 years. CHANEL Bijoux de Diamants 1932. 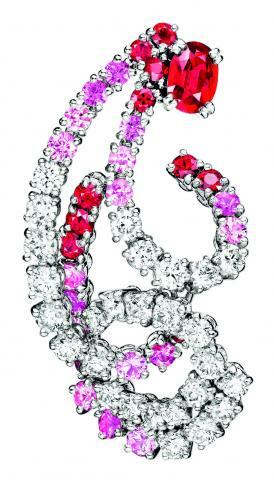 At CHANEL for Autumn - Winter 2010 they have chosen to recreate and expand the collection of Jewellery that Coco Chanel created. This collection like the others above was prepared ahead of the Biennale des Antquires in September 2010 in Paris. actually created her own collection of diamond Haute Joaillerie and it was launched in November 1932.
like many areas of her life it is a mystery as to why she did not continue. day very beautiful and capture the essence of classic CHANEL style. 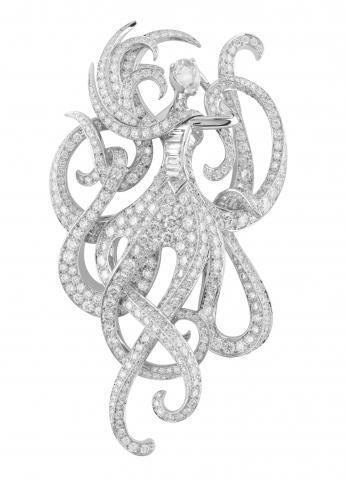 (C) Above the Broche Plume CHANEL. I think there is a delicate feminity in all these pieces that will appeal to most women, whether they are in love, hope for love or have lost love and remain alone. Beautiful things are always a pleasure to behold and radiate light into the spirit. I really believe that diamonds, just like crystals can be very relaxing and cleanse the spirit. These pieces of Haute Couture Jewellery show craftsmenship and artistry at it's hight. 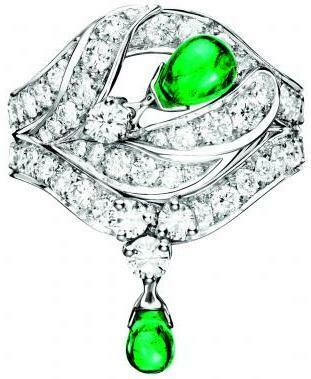 These pieces where the first emeralds that I've seen person that absolutely gripped me in their glowing green gaze. As I watched them dance I drew a comparison between the girls moving around the chess board and Josephine herself who was a skilled at understanding the movements on the European political stage but perhaps I was overthinking things. The show was breathtakingly beautiful and I am very gratful to my hosts. In the half-light of the ball room, the tiaras and hair ornaments shone just like they would have done under candle light in the past. Josephine's spirit lives on perhaps in many women today who are able to dance into the night wearing such beautiful pieces both newly created and antique. designed by American Architect Peter Marino. 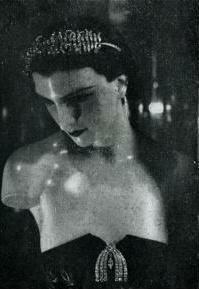 of Madam Chanel in 1932. The stones are set in 18k White gold. I have found that this is the best choice for working with diamonds in Haute Joaillerie as White gold enhances the luminosity of diamonds even further. (C) CHANEL Brooche Aigrette (C) CHANEL Collier Plume. that the House of CHANEL have exhibited there. found a very perfect symbol. (C) CHANEL Savoir Faire. It was wonderful to visit Paris for Haute Couture and Haute Joaillerie week in July and I would like to say a big Thank You to the Houses of Van Cleef & Arpels, Boucheron, Chaumet and CHANEL for such a warm welcome and a wonderful guided tour of their collections. I know that many pieces from these collections have been sold ahead of the Paris Biennale and that Haute Joaillerie is very much in demand. I've seen many inspiring visionery pieces of Joaillerie that are simply the most magnificent form of High art. I am very glad that Haute Joaillerie has been designated a part of Haute Couture week and can take it's rightful place alongside fashion in Paris.